The 2019 Royal Enfield INT 650 is a new model, and marks a major turning point for the brand. Here's our first ride review. The Triumph Street Twin returns with a number of significant updates that will expand its capability as a motorcycle for both urban and sport riders. With a nod to Shoei open face helmets of the past, the new Shoei J•O motorcycle helmet combines classic styling and paint jobs with modern motorcycle helmet features. Carbon fiber can truly transform a motorcycle, and the Ilmberger Carbon BMW R nineT Urban G/S solidifies this sentiment quickly. All of the changes that make the 2019 Honda CB300R a flawless urban motorcycle also make it quite fun in the canyons. Here's our review (11 Fast Facts). 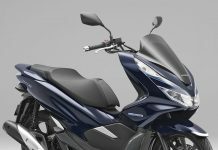 2019 Honda Super Cub C125 ABS First Look: The Super Cub returns to the United States after long absence, so let's look at the new Honda Super Cub C125 ABS. We can’t wait to get some seat time with the 2018 Kawasaki Z900RS Café, but until then, check out this photo gallery featuring this new retro-racer and an all original 1982 Kawasaki KZ1000R. We can now confirm that the 2018 Kawasaki Z900 RS Café is coming to America and it’s sure to turn plenty of heads. Based directly upon the sporting Z900, the Z900RS satiated a more classic, casual riding experience, to fit with its vintage charm. The Café pushes the envelope just a bit further. Despite its rugged look and Husqvarna’s competition heritage—the 2018 Husqvarna Svartpilen 401 is not a scrambler or sport bike. Instead, it is designed for new riders looking for a stylish urban motorcycle. We tested as a commuter and urban battler, along with some forays into the local canyons. Eight BMW R nineT Racer motorcycles were sent to eight BMW Motorrad dealers around England, and after 10,000 votes across social media, the winner was announced. Mandrill’s aptly named Dark Fighter BMW R nineT is a perfect representation of why the West needs to take heed of what’s coming out of Beijing these days. Triumph Motorcycles America, LTD, has recalled 2,824 of certain 2016-2018 Thruxton and Thruxton R motorcycles due stalling problems.